This is the first in a series of columns detailing the growing determination of women and children to influence climate change policy around the world. 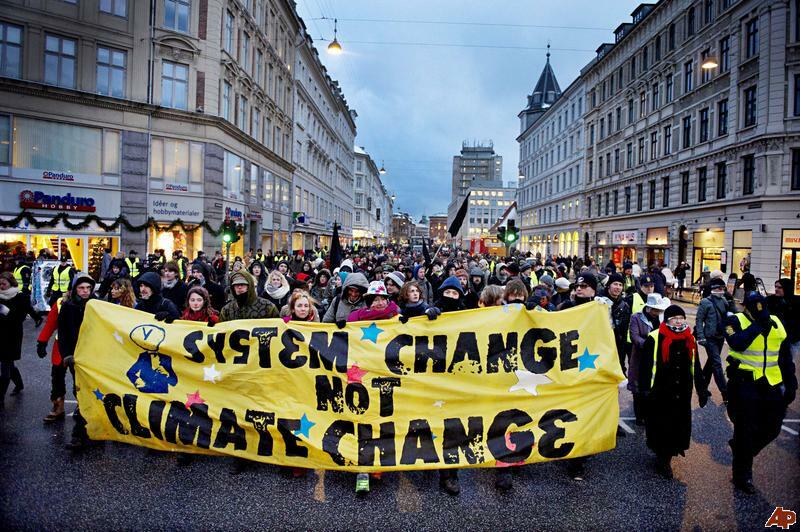 That slogan on a sign at a protest rally succinctly explains the need for a revolution to ensure a sustainable world. In 2017, the slogan gave birth to the Sunrise Movement, a youth-led pressure group striving to hold elected leaders accountable for a warming planet. It is “building an army of young people to stop climate change and create millions of good jobs in the process”, says its website. The movement’s co-founder is Varshini Prakash, a 25-year-old born and raised in the Boston-area, who understands that disrupting the status quo is how change happens. Prakash is just one of a number of women worldwide who are demanding a massive government-led intervention in the economy away from fossil fuels for the benefit of all people, not just the wealthy few. And one Swedish school girl has inspired students the world over to leave their classes and demand that their governments start caring about the future of their generation. The movement has already been successful in the political arena: Sunrise endorsed 30 candidates in the November 2018 U.S. election cycle and 19 of them won. “We needed a movement that could elect progressives ready to take bold action on climate change, and have a movement ready to hold all elected officials accountable and shift what’s politically possible,” Prakash told the Daily Kos in an interview. The movement was ready with a plan to achieve its goals. The Sunrise Movement’s Green New Deal would eliminate greenhouse gas emissions from electricity, transportation, manufacturing, agriculture and other sectors within 10 years. It would also aim for 100% renewable energy and includes a job guarantee program “to assure a living wage job to every person who wants one”. It would seek to “mitigate deeply entrenched racial, regional and gender-based inequalities in income and wealth”. Last December 10th, more than 1,000 youth with Sunrise lobbied 50 Congressional offices and sat-in at Democratic leadership offices demanding support for the Green New Deal. In total, 143 were arrested during the sit-ins. The Green New Deal was central to the high-profile campaign of Alexandria Ocasio-Cortez, a 29-year-old self-described “Puerto Rican girl from the Bronx” who won New York’s 14th congressional district last November as a Democrat. The Green New Deal that Ocasio-Cortez and a growing number of members of Congress now support is straightforward: Power the U.S. economy with 100% renewable energy within 12 years, establish a federal living-wage jobs program, institute universal health care, and help workers move from carbon-tied jobs to more sustainable employment. Prakash and Ocasio-Cortez are among those counteracting the new rhetoric of the status quo – climate gradualism – which promotes a slow, incremental, and impractical approach to the global warming problem that champions fossil fuels for the next 20 to 50 years. These women believe it is just a new form of climate apathy. “Both women and men are important actors in designing conscientious climate policies. Women are generally more sensitive to risks and more willing to change lifestyles, while men more strongly believe in technical solutions,” says the gender into climate policy document. Women are more vulnerable to the effects of climate change. They are disproportionately affected by global warming impacts such as droughts, floods, and other extreme weather events, especially in developing nations. In the event of water or fuel wood shortages, decreased agricultural productivity, famine, and care-giving demands in post-disaster situations, women’s workloads are increased. Now, in ever growing numbers, women are standing up to play a vital role in developing lasting climate solutions. “This is a global fight, honestly, to protect the future of human civilization, and I think that’s how our generation really sees it, which is why we’re seeing people rise up in every corner of the world,” says Prakash. The healthy dose of outrage exhibited by the youth of the Sunrise Movement is not unique to American activists. Now a 16-year-old, Thunberg recently spent 32 hours on a train to the Swiss ski resort of Davos where she gave her message to the world business elites attending the World Economic Forum. She did not mince words. Her blunt judgement momentarily shocked the audience to silence, but eventually they applauded. “I don’t want your hope. I don’t want you to be hopeful. I want you to panic … and act as if the house was on fire, because it is,” Thunberg added. In both the United Kingdom and internationally, the face of non-violent direct action is Dr. Gail Bradbrook, the 46-year-old co-founder of the world-wide social movement Extinction Rebellion (XR). Beginning in 2015, Bradbrook co-founded the group Compassionate Revolution, which morphed into Rising Up! – a social movement calling for a fundamental change of the political and economic system to one which maximizes well being and minimizes harm. Extinction Rebellion grew out of those two organizations and in October 2018 launched a series of protests that mobilized thousands of many first-time activists and caught the attention of the media. Bradbrook protests to raise awareness of the dangers from anthropogenic climate change and believes that only civil disobedience on a large scale can bring about the change that is needed. In just a few short months, XR followers have superglued themselves to or spray painted government buildings, blockaded bridges, and blocked streets in central London, defying police to arrest them. XR is gaining thousands of followers daily from as many as 25 countries. There is an Extinction Rebellion Canada, an XR B.C., and an XR in Cowichan and one in Howe Sound. The rising tide of involvement by women and children to effect change on the climate issue will – in my humble opinion – prove the tipping point so desperately wanted by all of us who are concerned about the plight of our planet. Perhaps in 2019, 2020, or 2021, social engagement around the topic of climate change by the climate concerned will overcome the climate dismissive, finally forcing decision makers to take bold, visionary, and real action to halt the environmental dismemberment our planet is suffering. Those who have used their economic, political, and ideological beliefs to block aggressive reduction of carbon dioxide emissions will have their foundation overthrown. As more and more ordinary people realize how global warming is impacting their lives, ignorance will no longer triumph over scientific certainty. The influence of the affluent to affect public policy will halt and decisions will be made for the benefit and needs of all citizens – rich, middle-class, and poor alike. A renewed sense of urgency and a greater willingness to resort to civil disobedience and other forms of activism will catalyze the movement, end the status quo, and bring about large-scale societal change. The future is something we create together in the present. The simplest way to understand and change our predicament is to recognize that being human is a team sport. The planet we share has been rendered fragile in our hands. The changes our society needs will be led by us – ordinary citizens. It requires that we ordinary citizens accept the responsibilities bestowed by our rights and freedoms. But this is an emergency. Every bit of warming matters; every year matters; every choice matters. And so we have to rise up now and give our support to the women and children who are guiding our way. And so we have to rise up now and form the rebellion. And so we have to rise up now and join the rebellion.